The Best Western Hotel A Austerlitz Brno is situated near the main road as well as the exhibition ground. The hotel is located near many local attractions. Guests will find themselves near Spilberg Castle, Chateau Austerlitz, and the Moehrisches Castle Museum. The Best Western Hotel A Austerlitz Brno is located only a short drive away from the Brno airport. Public buses also run throughout the city, offering travelers easy access to the airport as well as to Brno points of interest. Taxis and rental cars are also available. 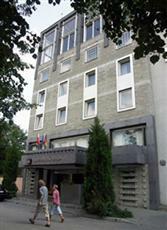 Each of the guestrooms at the Best Western Hotel A Austerlitz Brno is well appointed and offers satellite television. Rooms also include direct dial phones and minibars. Private en-suite bathrooms include hair dryers and the hotel offers guest laundry services. The Best Western Hotel A Austerlitz Brno is located near many of Brno’s shops and restaurants. The hotel offers a coffee bar and dance hall onsite as well as a lounge. There is also an onsite restaurant and the hotel is located near squash and tennis courts.